Arthritis hip pain relief exercises should begin with a solid program aimed at first stabilizing the pelvis before you begin to strengthen the tendons and muscles of the hip joint. When you have hip pain it can radiate from the lower back all the way down into your legs causing you undo discomfort that can generally be alleviated by doing low impact exercises such as Pilates and Swimming. 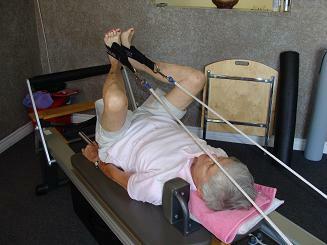 Below I have listed some arthritis hip pain relief exercises based on using Pilates Principles. These exercises and many others can be found in the new Pilates Ebook available here today. Lying on the floor with neutral spine and knees bent with your feet flat on the floor. Imagine your pelvis as a clock. 12 o’clock is at your navel, 6 is at your pubic or tailbone, 3 and 9 are the hip bones. Now imagine there is water in that clock or bowl and you are going to empty from 12 o’clock around clockwise and then counterclockwise feeling each number on the clock working. Keep the knees still and just move from the pelvis. Lying on the floor with one leg extended along the mat and the other at a 90 degree angle to the floor and a neutral spine. See picture at right for modification to the leg circle using a stretch band to support the leg by wrapping it around your foot. Keeping the pelvis still circle the thigh (leg) in the hip socket 6 times each direction. Switch legs. Focus on keeping the torso and leg on the mat very still as you freely circle the leg in the air. Frog Legs - Shown on the reformer, but can be done on the mat. This is a good SI joint exercise and to help strengthen the inner thighs. Lying on the floor with the spine in neutral and both legs up at a 90 degree angle with the heels together and toes turned out, this will open the knees wide. Keeping the spine in neutral on the mat extend the legs up to the ceiling or 10 degrees lower keeping the heels squeezed and toes turned out. Feel the back of the inner thighs squeeze together. This arthritis hip pain relief exercise is more advanced and should be done after your pain has subsided, hold onto something for extra balance. Standing tall with your ribs over your pelvis, drawing your abdominal muscles up and in, and reaching out through the back top of your head. Reach one leg out to the side without changing your standing posture. If you have to lean then you are going to far with the leg. Repeat this action for 6-10 times on each side or as long as you can balance on one leg. I would also recommend any of the Pilates Side Kick Series to help strengthen the inner and outer thighs, as well as stabilizing the muscles of the hips and pelvis. 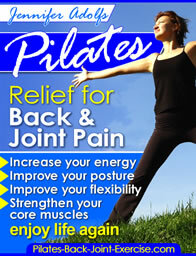 Find more ways to use Pilates for your arthritis hip pain relief exercises from these free pages.